It's always listening to you and comes from a division of Facebook run by the former head of US military madtech arm DARPA*, so what could possibly be creepy about Facebook's new hardware experiment, Portal? Facebook bills Portal as a video-calling device designed to always be on – making distant friends and relatives more accessible. Portal is a 10-inch display (1200x800) and Portal+ a 15-inch HD whopper. It comes with Alexa built in, and is priced for mass appeal: $199 and $349. Remarkably, it doesn't run Facebook – there's no web browser. And the social networking giant has gone to some trouble to allay fears about the fact Mr Zuckerberg will now take up a permanent residence in one corner of your home. The little bit of innovation here comes from a camera that zooms in on its subject to improve the quality of the video chat. Perhaps, like the iPad, it's another market-category-making gadget we didn't realise we needed until someone made one. Something that will accelerate the adoption of new services. Or perhaps it's another flop, like the home web appliance which it so closely resembles. Home web appliances proliferated around the time of the dot.com boom. Microsoft hoped to create a new product category in 1999 with "MSN Companions". 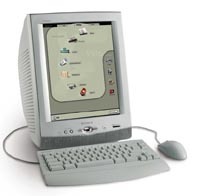 The resulting Compaq product looked like what it was, a marooned PC cursed with Microsoft CE. Sony's eVilla and Be Inc's BeIA also tried, and also failed. Not one survived after the flood of silly money dried up. For Portal to succeed, Facebook must persuade punters who already have very capable video chat hardware (their phones and tablets) to spend nearly $700 on a pair of devices that need to stay plugged in all the time.